Hi guys!!!! 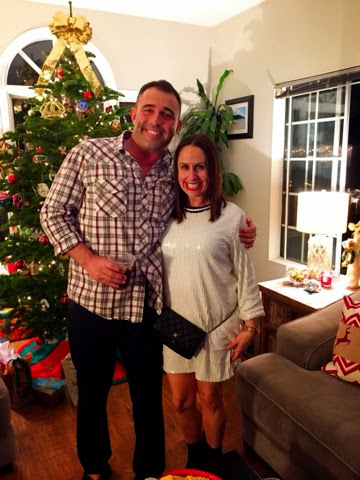 My BFF Jessica and her husband Kyle had a little holiday gathering at their house by the beach. 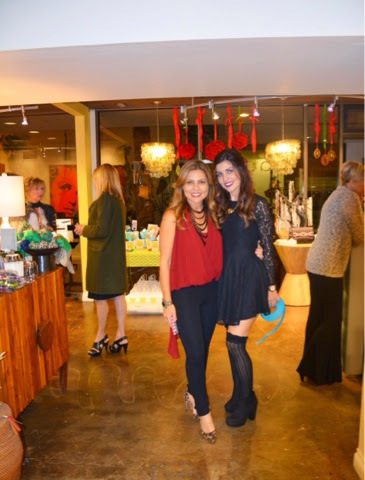 It was such a festive evening with lots of yummy food and drinks and of course fun people. 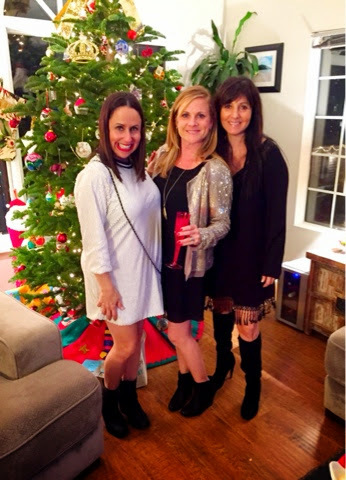 I wore this white sparkle dress by Glamorous and my go to Rag and Bone Booties. 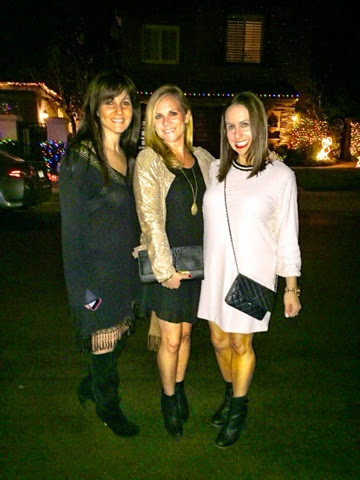 My girlfriends looked absolutely beautiful in their holiday outfits. I recommend that you all try to add something with sparkles into your wardrobe. Since New Year's Eve is right around the corner, a sequin dress, pants, or jacket is the perfect addition to your NYE outfit. It is such a fun look and is perfect for this time of year (even though I wear sequin and sparkles all year round). So try adding some sparkle into your wardrobe. Thanks to Cathy Cordas for photo editing and don't forget to follow me on Instagram, Facebook, Twitter and Bloglovin. Happy New Year and happy reading!!!! Hi guys!! Hope you are having a great holiday season. I love this time of year, and especially all the fun events and parties. 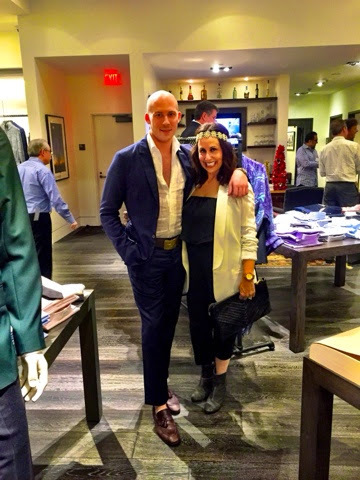 Cathy I and were lucky enough to attend an event at Gary's in Fashion Island for a fabulous New York City men's line called VKNagrani. It offers luxury clothing for men. Check them out at VKNagrani . 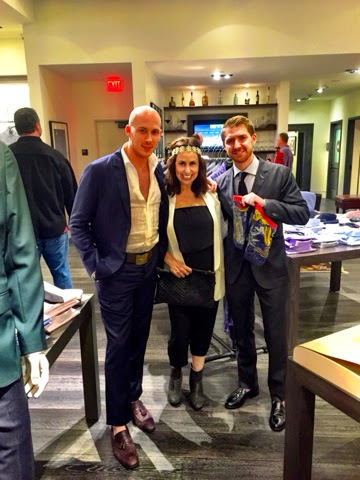 Thanks to our friend Max Hirsch for including us. 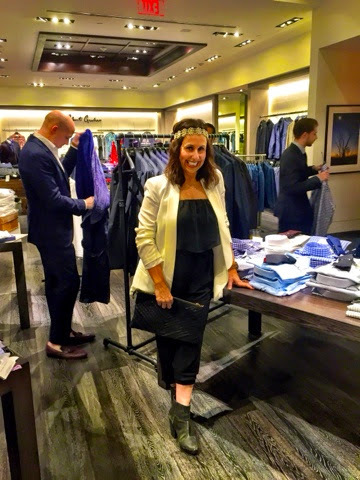 I decided to wear a black jumpsuit that I paired with a white blazer, my Rag and Bone booties, and a Krown headband. Cathy and I had a great time at this event. We don't get to see men's fashions often so this was a real treat. What are your favorite items in men's fashion? Let me know. Thanks to Cathy Cordas for photos. And don't forget to follow me on Instagram, Facebook, Twitter and Bloglovin. Happy reading!! Hi guys!!!! Happy holidays everyone!!! 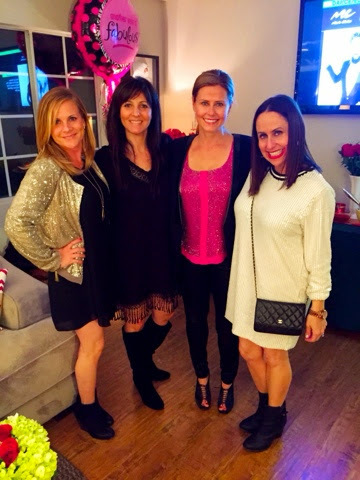 My BFF Jessica planned an amazing lunch for all of our girlfriends at the Surf and Sand Hotel in Laguna Beach. The hotel was beautifully decorated for the holidays. Jessica had a great idea as part of our lunch. Each of us ladies brought an unwrapped toy to donate for Toys for Tots. What a great idea!!!! I decided to wear this great Veronica M dress. 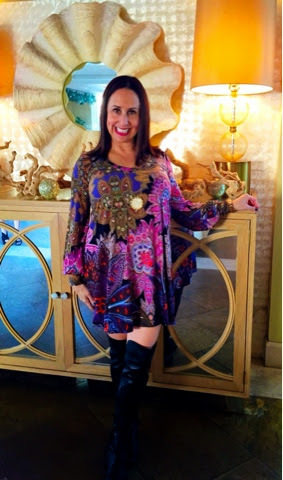 I love the paisley print and purple color scheme. I also love the cut and shorter length of this dress. It is easy to wear and flattering. 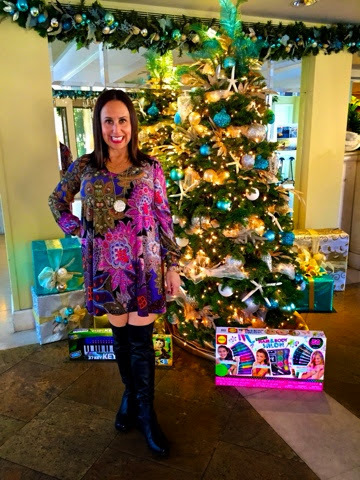 I paired this dress with my over the knee Stuart Weitzman boots and my look was complete. 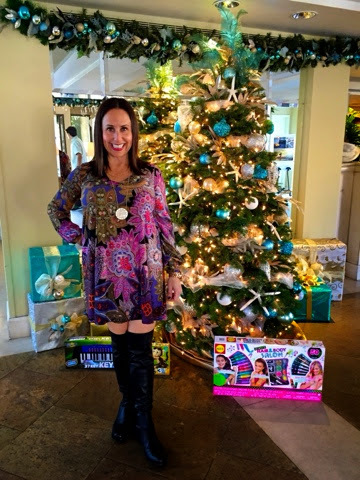 I had a great day at my beautiful holiday lunch. What are you all doing for the holidays!!!! Let me know. Thanks to Cathy Cordas for photo editing and don"t forget to follow me on Instagram, Facebook, Twitter and Bloglovin. Happy reading!!!! Hi guys!!!! 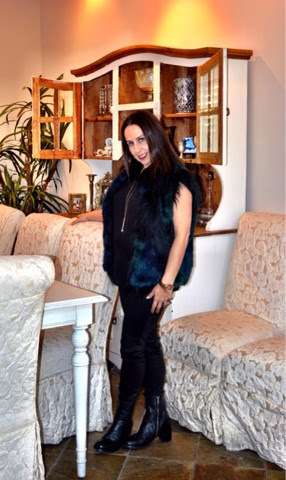 I thought it would be fun to show you all how easy it is to transform a basic black shirt and black jeans into a whole new look by adding one simple piece: My favorite item of clothing for the fall, a faux fur vest. 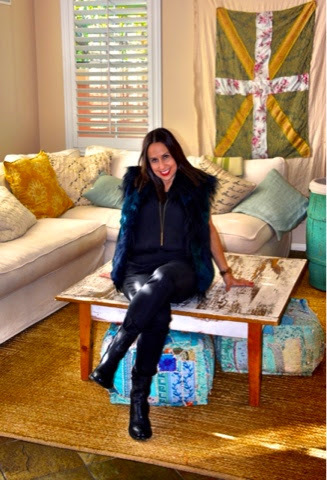 I know I've talked about the faux fur vest before, but there are many different styles, lengths and colors. 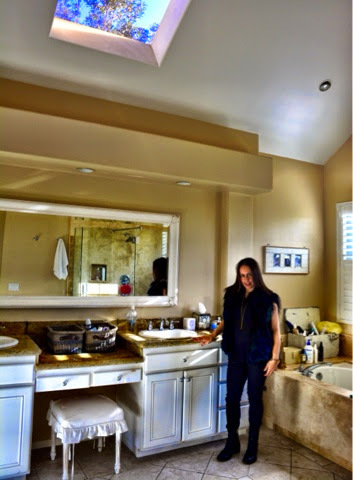 Many of you must have a basic black top and black jeans. This look is classic and easy. Then, if you add a great faux fur vest, it creates a whole new look. The vest gives the simplicity of the outfit some edge. To complete this look, I added some great black booties. I hope you all invest in a fabulous faux fur vest and add it to some of your basic outfits that are already part if your existing wardrobe. I would love to hear about your looks. So let me know by leaving comments. Thanks to Cathy Cordas for pictures and don't forget to follow me on Instagram, Facebook, Twitter, and Bloglovin. Happy reading!!!! Hi guys!!! I can't believe that the holidays are here. Holidays are a time to spend time with family. They are also a time to give gifts to our loved ones. I wanted to share with you some of my favorite gifts that I have both given and received. 1) Urban Decay Naked eye shadow-- I am obsessed with this makeup set. It has the best colors and it includes a double sided brush. I have been using it every day. 2) Ina Garten Make it Ahead Cookbook-- I just love the Barefoot Contessa and all of her books. This is a great gift for the cook in your family. 3) Sees Candy-- This is the ultimate gift that everyone loves. I buy boxes for many loved ones to say thanks for all they have done for me in the year. 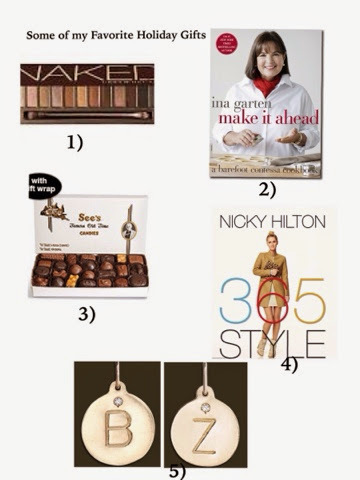 4) Nicky Hilton 365 Style book-- I love this book. It is a great gift for the special lady in your life and provides many outfit ideas and looks. 5) Helen Ficalora Initial Charms-- My husband Jeff bought me these a few years ago and I wear them almost every day. These are the initials of my children and are so special to me. So happy holidays and good luck gift shopping. I can't wait to hear about all your purchases!!! Let me know what you decide to buy for gifts this season. Happy reading and don't forget to follow me on Instagram, Facebook, Twitter and Bloglovin. Hi guys!!!! 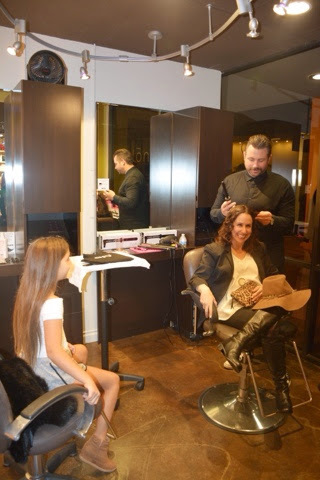 I just attended an amazing client appreciation party at one of my best friend Rita's hair salon, Salon 359. 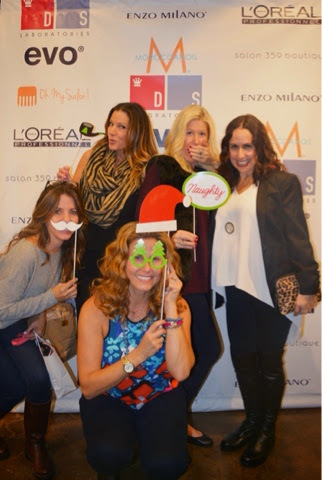 The girls of Salon 359 really know how to throw at party. 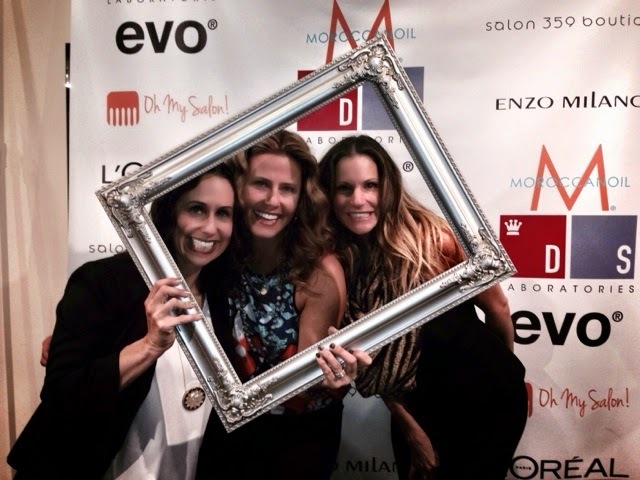 My girlfriends and I had the best time drinking Champagne and snacking on yummy treats, getting our hair done by evo and Enzo Milano, shopping at Heather Pullis Designs (one of my new favorite OC boutiques) and taking pictures at the Oh My Salon App Station. 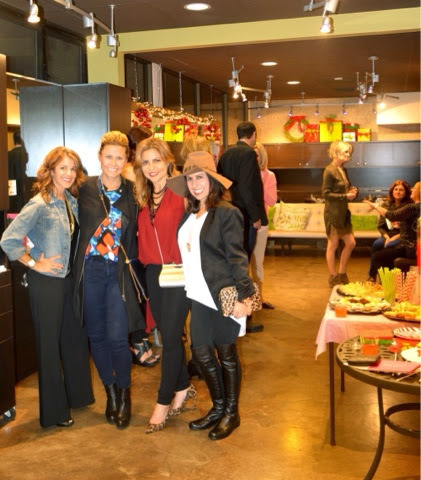 What a great party with such a special group of ladies!!! And by the way, how absolutely adorable is Cathy's daughter Raquel? She is definitely one of the girls. I decided to wear my basic black blazer, a Topshop white high low top, black coated jeans, and my new favorite Stuart Weitzman 50/50 over the knee boots. 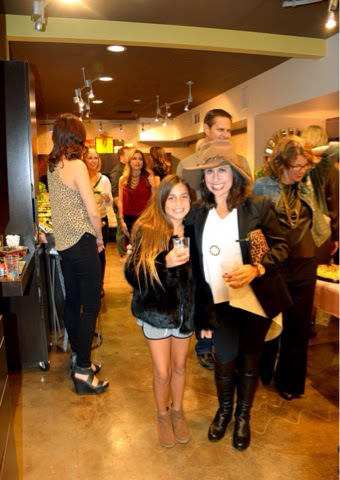 I added this House of Harlow necklace, leopard clutch and my brown felt floppy hat and my outfit was complete. So if you are in the OC area, check out Salon 359 !!!! You will love it. They always make me look my very best!!!! Thanks to Cathy Cordas for photos and don't forget to follow me on Instagram, Facebook, Twitter and Bloglovin. Happy reading!!! Hi guys!!!! Cathy and I just attended a media event at the new RARE by Goodwill store that opened in Anaheim on December 5. The store focuses on a shopping experience that creates a new retail concept to spark imagination, be inspired and reinvent something to fit your individual personality. 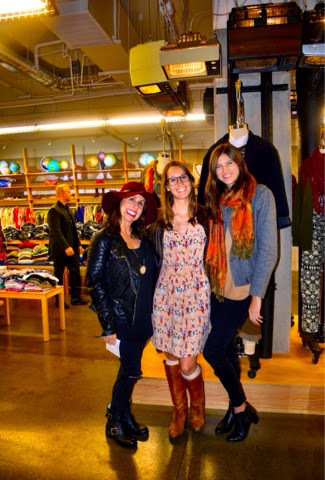 Unique items from clothing and shoes to home goods and decor are specifically chosen and transformed into one of a kind pieces by each individual shopper. RARE by Goodwill lets you be the designer. The unique items sold at RARE by Goodwill will help generate jobs for people facing barriers in the community. I decided to wear my Blank NYC black faux leather jacket, a lush top and Topshop jeans. 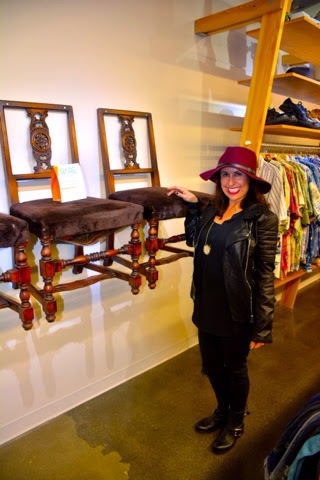 I completed the look by adding my Jimmy Choo moto boots and my new favorite burgundy hat from Heather Pullis Designs. I love this colder weather out here in the OC. It is the perfect time to pull out my favorite hat and boots. 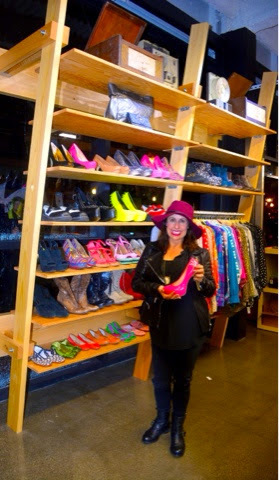 RARE by Goodwill is located at 411 W Broadway, Suites C-H, in the heart of Downtown Anaheim. 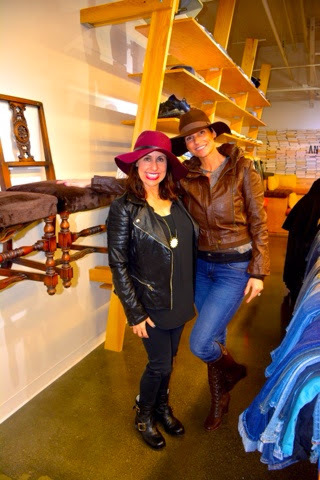 Cathy and I had the best time looking at all the clothing, shoes and home goods. 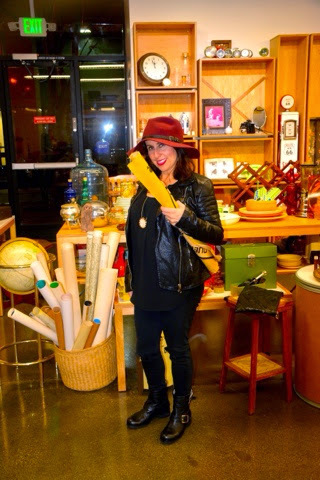 The items are so eclectic and the store has such a hip vibe. So if you are around the Anaheim area you must visit RARE by Goodwill. You never know what you may find!!! Thanks to Nicole Morrison with Cornerstone Communications for putting on a great event and to Cathy Cordas for photos and don't forget to follow me on Instagram, Facebook, Twitter and Bloglovin. Hi guys!!! 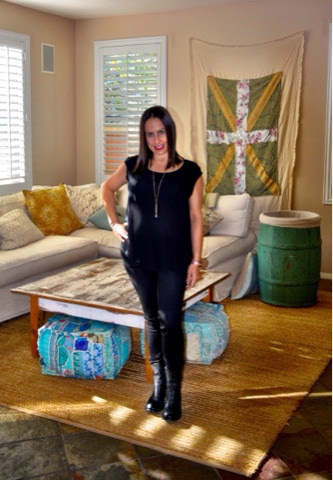 It is so exciting that Everything Evelyne was featured for a second week in a row in the OC Register for Corona del Mar Street Style. 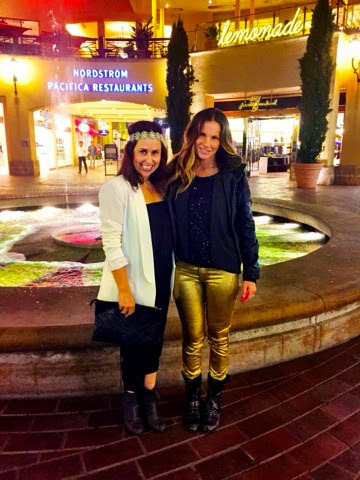 Cathy and I visited the Corona del Mar Plaza and found these beautiful ladies looking stylish. Here is Chrissy Roletter, wearing a Red Thread Cashmere poncho and beanie, Lululemon pants and tank, Ugg Italian leather boots, and amazing Red Thread Cashmere jewelry. Red Thread Cashmere is such an amazing line of cashmere yoga wear and accessories that help to empower women to be the best they can be. Here is Maxine Michelson in an adorable Red Thread Cashmere shrug (which I am obsessed with), Joie pants, Coach wedge booties, Prada glasses, and her own jewelry. 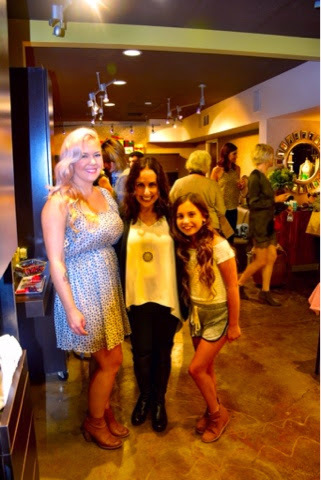 Here is the beautiful Nicole Linkon in a Free People dress, a Love Heels necklace, a Mikal Wynn bracelet, Joe's tall black boots, and a Cleobella fringed bag. 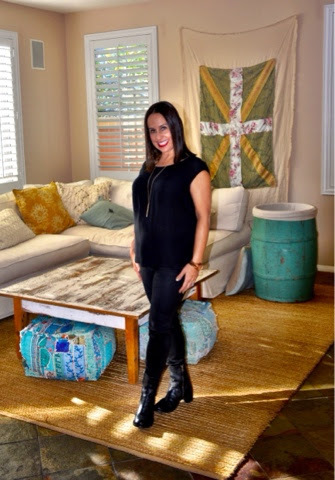 Kerry Blower is looking fabulous in a Vince Camuto shirt, Louis Vuitton purse, Flying Monkey Jeans, and amazing Lucky Brand boots. 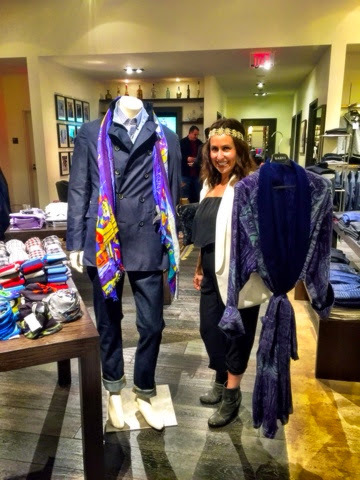 How adorable does Stephanie Berger look in her Painted Threads cardigan, Habitual jeans, Sam Edelman booties, and a Michael Kors watch? These beautiful ladies look stunning in their day looks and they all have one thing in common: they are all wearing a form of boots or booties. How do you rock the boot trend? Let me know. 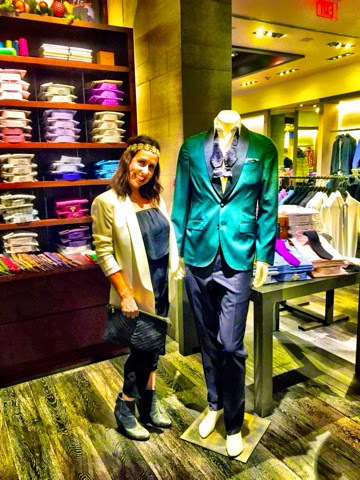 Stay tuned to www.everytingevelyne.com to spot more stylish looks around town. Thanks to Cathy Cordas for photos!!! And don't forget to follow me on Instagram, Facebook, Twitter and Bloglovin. Happy reading!!! !